This is the 1st in a 3-part series, in which I review Erin Lindsey’s ‘Bloodbound’ series. “The Bloodbound,” by Erin Lindsey is a different kind of fantasy series. And that is a very good thing. Although I love Tolkien, as was purportedly said by another Don at a reading of Tolkien’s latest chapter of the Ring: “Please!! no more f$%#ing elves!” As a fantasy writer myself, I like ‘different’. What we will be doing over the next three days is post blogs reviewing all books in the trilogy. The following review of Book 1, The Bloodbound, from which the series takes its name, was previously published. We’ll review Books 2 and 3 tomorrow and Wednesday. In a very good sense, it is a ‘quiet’ fantasy. 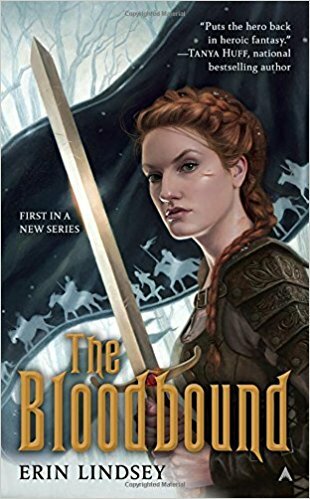 While there is plenty of action in “The Bloodbound,” the most satisfying reading involves being drawn into the emotional lives of the characters. Some have objected to ‘love triangles’, but this one involves not just the heart, but adherence to duty and tradition. It is engaging to participate in Alix Black’s emotional evolution. The theme of duty is reflected as well in the difficult calculus of adherence to one’s word, by treaty, and commitment to country over allegiance to a sovereign. It is difficult to parse the ethical conflict inherent in the rift between Prince Tomald and his brother King Erik. The author’s long experience in the nuances of international relations and the ethical questions of ‘good and evil’ that are not easily determined, served her well in this story. One final note. Another aspect of this fantasy that is noteworthy is the simplicity of the ‘magic’ in the story. Often fantasy writers endow their characters with magical powers, rings or wands or staffs, that conjure up all sorts of solutions to the jams into which their characters find themselves. Lindsey uses one: Blood, for both antagonist and protagonist. It is refreshing. Perhaps that is because it is the kind of ‘magic’ I prefer to have my characters employ.